Modern engagement rings have a long and intricate history, dating all the way back to the time of the ancient Egyptians. In fact, mummies have been unearthed wearing metal bands around the third finger of the left hand. In ancient times, it was believed that a vein attached to this finger ran directly to the heart. Similarly, the ancient Romans believed that an important nerve ran from the third finger to the heart, causing them to adopt the custom of giving engagement rings as well. The majority of historians agree that the first record of rings officially used to mark an engagement was in 1477, when the Austrian Archduke Maximillian gave a ring to his fiancÃ©e, Mary of Burgandy, following his proposal. Up until the 1800s, rings were in common use. Mentioned many times in Shakespeare's plays, engagement rings were frequently made of silver and were exchanged for gold rings at the wedding ceremony. 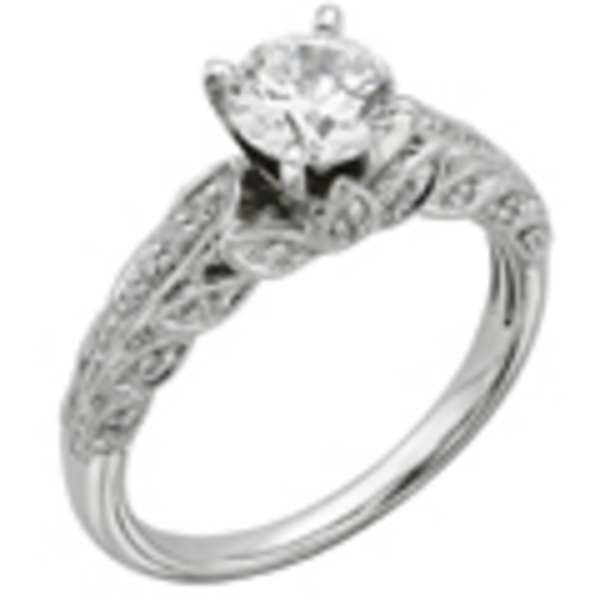 In the 1800s, there was an explosion of the romantic elements represented by engagement and wedding rings. The main force behind this was Queen Victoria of Great Britain, who was famously known for being deeply in love with her husband. Victorian-era engagement rings often featured hearts, flowers, bows and, oddly enough, snakes. Diamonds became a common feature in engagement rings at this time, after an enormous cache of diamonds was unearthed in South Africa. During this time period, Tiffany & Co. introduced the "Tiffany Setting". This new style raised the diamond above the band to allow for maximum brilliance. The style has influenced the design of engagement rings ever since. During the Edwardian era in the 1900s, engagement rings became a widespread social custom. With the advent of the industrial revolution, national economies were on the rise and the middle class were able to afford fine jewelry. Engagement rings designed during the Edwardian era often featured diamonds in ornate and lacy platinum bands. In the 1920s and 1930s, engagement rings became less feminine and more geometric. This reflected the era's adoration of everything "modern". These engagement rings often featured diamonds in settings of white gold or platinum, surrounded by colorful stones such as rubies and sapphires. During World War II, engagement rings were large and bold. These rings frequently boasted curving designs and many feminine features such as bows, ribbons and flowers. Because platinum was being used to help the war effort, gold was the metal of choice for rings during this time period. The trend of stackable rings in different colors may have been started by Audrey Hepburn in the 1950s. Her husband, Mel Ferrer, gave her rings in both rose and yellow gold so that she could match them to her outfit. The 1960s was the decade during which celebrities began making headlines with their engagement rings. In 1963, Elizabeth Taylor's fiancÃ© presented her with a 33-carat diamond. Jacqueline Kennedy's diamond and emerald engagement ring helped to popularize emeralds as engagement ring gemstones. Two diamond cutsâ€”the radiant cut and the princess cutâ€”were perfected during the 1970s. The square shapes of these two cuts instantly became very popular. Princess Diana's choice of an oval sapphire ring caused the popularity of sapphires to rise during the 1980s. From the 1990s until the present day, there has been no single dominant trend for engagement rings. Modern couples have the unprecedented opportunity to see and choose from a multitude of ring styles. Although the styles of engagement rings vary from one year to the next, the basic lookâ€”a ring with a prominent, shimmering diamondâ€”continues to be the most sought-after setting of all.